A recent Pew survey of American Muslims found that the majority (56 percent) believed that "many religions" can lead to Paradise; only one-third held that Islam "is the one, true faith leading to eternal life." Ours is a world of ever-increasing interconnectedness. More and more Muslims today work with, befriend, and marry non-Muslims. It is perhaps not surprising, then, that a significant number of American Muslims would choose to believe that God will save their Christian parents, Jewish spouses, Buddhist neighbors, Hindu friends, or even atheist coworkers. The essays in this volume look at the views of Muslim theologians on this matter. Most maintain that while faith in the fundamental doctrines of Islam is theoretically required for salvation, God will excuse non-Muslims who never encountered the divine message conveyed by the Prophet Muhammad. (Whether such "unreached" non-Muslims still exist is the subject of much debate.) Some go a step further, and hold that God may redeem non-Muslims who were never exposed to the message in a manner that could prompt contemplation and encourage conversion. A third group of theologians-not the kind typically found at major Islamic seminaries and universities-argues that God may even save and reward non-Muslims who had a "compelling" encounter with the Islamic message yet chose to remain outside the fold. The diverse advocates of this last approach face a daunting task: demonstrating that their seemingly modern doctrine is compatible with the Islamic ethos. In recent years, considerable attention has been devoted to this debate, and indeed the larger question of non-Muslim salvation. How one regards the Other undoubtedly affects how one interacts with the Other: Should I marry her? Should I call him to the faith? Should I pray for her even though she passed away without ever converting to my religion? Should we establish missions? Should we show our love to Others to encourage rectification, or, given that their path is crooked, should we shun them? 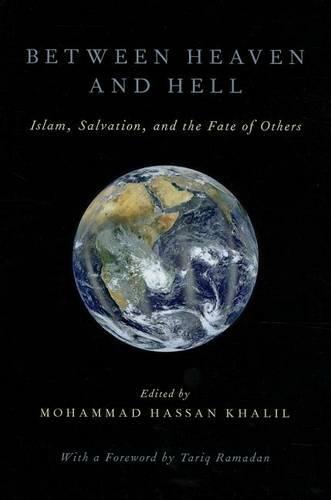 Between Heaven and Hell is intended to foster appreciation for the diverse and novel approaches taken by scholars of Islam when addressing the consequential topic of soteriology (the discourse and doctrines of salvation) and the fate of Others.